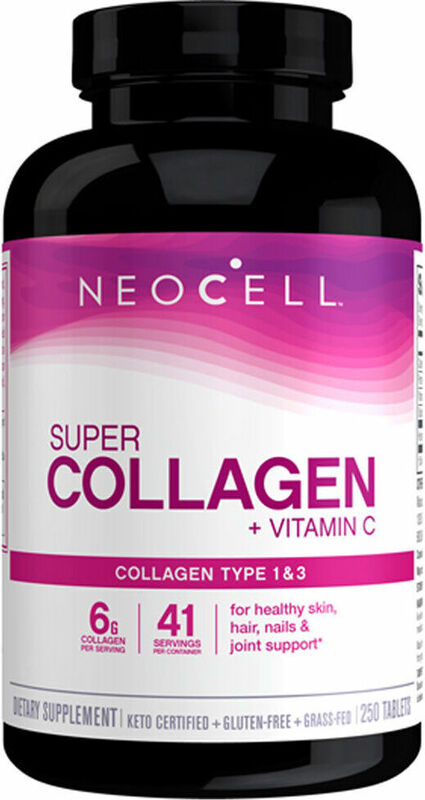 Super Collagen Type I & III derived from 100% pure pharmaceutical food grade bovine collagen, Vitamin C (as calcium ascorbate) and may contain magnesium stearate(asan anti-caking agent). As a food supplement, take three (3) tablets twice daily preferably on an empty stomach for maximum absorption and wait 30 minutes before eating or before taking any other protein products. For enhanced results use with hyaluronic acid. Not to exceed 12 tablets daily. Note: Super Collagen Type I & III is not a complete protein and should not be used to replace a dietary protein. Take six(6) tablets Daily .For Maximum absorption, take on empty stomach. KEEP OUT OF REACH OF CHILDREN. ALLERGY WARNING:May contain sulfite residues. COLLAGEN (collagen hydrolysate) is a complex structural protein that maintains strength and flexibility of skin, ligaments, bones, joints, muscles, tendons, gums, teeth, eyes, blood vessels, nails, and hair. SUPER COLLAGEN TYPE I & III is 100% pure collagen protein that provides building materials for growth and maintenance of a healthy body. When Super Collagen is taken internally, the body receives the raw materials it needs to supplement the collagen found in all of these areas. Super Collagen is enzymatically processed into its amino acid form with a very low molecular weight, which can be utilized 100% by the body. Super Collagen +C tablets are formulated with Vitamin C to provide optimum supplementation of your dietary collagen needs. Does Not Contain Sucrose. Starch. Yeast. Wheat. Corn. Dairy. Cholesterol. Fat.